Soft wheat and feed barley prices have continued their move higher this week. Exporters are chasing these lower grades as they have become very cheap. Chicago Board of Trade also found some extra strength, until last night, which has been adding support locally, and providing some opportunity for new crop. Most of the talk this week has been around ASW, especially in Victoria. 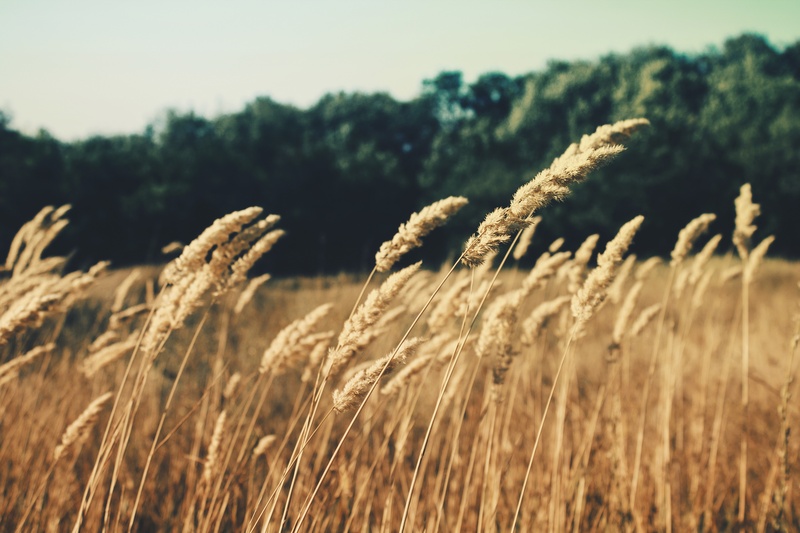 With the Shipping Stems showing multiple boats are coming into Melbourne, Geelong and Portland over the coming month, looking for wheat, buyers are having to lift prices to secure supplies. 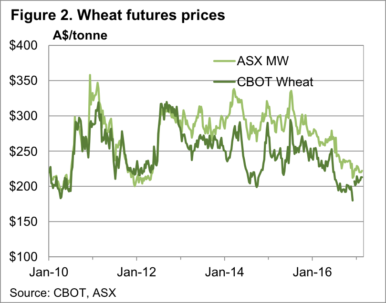 Plenty of ASW has been bought on CLEAR Grain Exchange, and direct through brokers at around $200/t Port in Geelong and Portland. Port Adelaide has seen action on ASW between $190 and $200/t. In the Melbourne Port Zone ASW had been up to $205/t. The improving prices for ASW have been due to both increasing CBOT values, and rising basis. 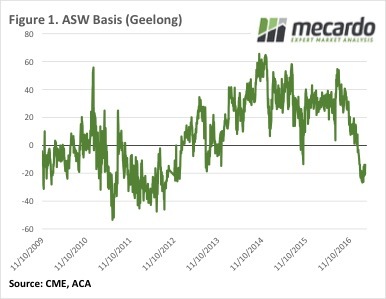 Geelong ASW basis has bounced off a four year low of -$27, to sit at a more respectable -$14 yesterday (figure 1). Additionally CBOT wheat has held onto most of its gains from recent weeks, sitting at $215/t in our terms. The result is ASW up around $20 from its lows. While the absolute price doesn’t sound great, a more than 10% increase should be welcome. Feed Barley has also made gains, but more moderate, up $10 from the lows to sit at around $165/t at Port. Again, absolute prices are not great, but the increase has at least provided some payoff from storing. CBOT tried to break out of its five year downtrend last night, but came crashing back thanks to the sheer volume of wheat in the world. December-17 and March-18 CBOT wheat is priced around $250/t, and at better than full carry to the current market. This equates to a local APW price of $240-260/t under current basis levels, which looks pretty attractive given the state of the market at present (figure 2).